The tragic stranding of nine orca in western Southland earlier this year prompted a blueprint for customary recovery. The mass stranding of a pod of nine orca on an isolated beach in Te Waewae Bay in western Southland in February was a rare event that may have a positive outcome for international research, say scientists working with Te Rūnanga o Ōraka Aparima. New Zealand is regarded by many marine scientists as the whale stranding capital of the world. However, that unfortunate distinction relates more to the diverse range of whale species found in warm and cold water currents around the New Zealand coast than any other reason. Joe Wakefield (Kāi Tahu, Ngāti Toa Rangatira, Te Ati Awa, Ngāti Mutunga) who is team leader, Mauri, for Tribal Interests at Te Rūnanga o Ngāi Tahu says the orca strandings presented the rūnaka with a significant challenge. Timing was critical because the orca carcasses deteriorated quickly after stranding. “We found ourselves in a situation where we had to step up as kaitiaki. It’s all very well telling the Crown and everyone else about kaitiakitanga and tikanga Māori, but to me this was a prime example of a situation where, once the decision was made to recover these orca for customary use purposes, then we had no choice but to step up and put into practice what we have been preaching to everyone else in the past, in this case to take a lead in the customary recovery of nine orca. Positive feedback from the scientists involved since showed that mātauranga Māori and Western science could work together, he says, and this case provide a blueprint that could work elsewhere in New Zealand. In a detailed report to Ngāi Tahu whānui, Joe noted that 14 whales had been recovered for customary purposes in the past 13 months, across four rohe in Te Waipounamu. Orca Research Trust founder and principal scientist Dr Ingrid Visser says there have been more than 40 documented incidents of orca strandings in New Zealand. 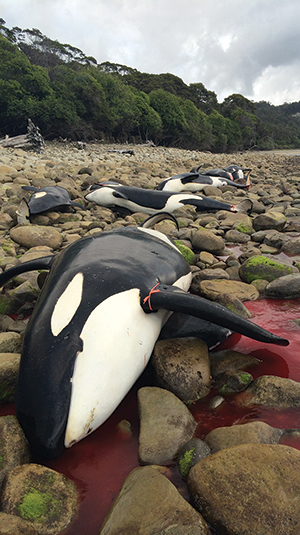 The mass stranding at Kutu Awa on Te Waewae Bay in February 2014 was the third largest incident recorded in this country. In 1955 17 orca stranded at Paraparaumu, and 12 stranded in the Chatham Islands in 1981. “I have seen mass strandings before and multiple strandings of individuals, but most of the time we manage to save the animals, and that’s what makes this such a tragedy,” Dr Visser says. “It was just such a remote location, and they weren’t found until it was too late. Dr Visser has extensive photographic records of the individual markings of 150 of an estimated population of about 200 orca that frequent New Zealand waters. However, she did not recognise any individuals that stranded at Kutu Awa. Like the other mass strandings in 1955 and 1981, the cause of the latest strandings remains a mystery. “We couldn’t conduct a full autopsy because by the time we got to the animals they were already a few days old,” she says. Eyewitness reports confirmed the whales were alive when they came ashore, and their body condition showed they were fat and healthy. There were however some distinctive signs that suggest this pod of orca may have had a different range, hunting, or foraging behaviour than others that frequent New Zealand waters. Several had distinctive oval-shaped cookie cutter shark bites out of their flesh, which Dr Visser says indicates they had travelled into the tropics or sub-tropics at some stage of their lives. Cookie cutter sharks only grow to 54 cm in length, and the furthest south they have been recorded is around East Cape in the North Island. One orca had at least 33 cookie cutter shark bites on it, which until recently was regarded as a world record. The other remarkable feature of these orca was that many had heavily worn teeth, in some cases worn right down to the gums, which suggests different hunting or foraging techniques than any known populations of orca around the New Zealand coast. Volunteers from Ōraka Aparima helped scientists extract more than 400 teeth from the orca carcasses in February. Under the supervision of a dolphin teeth expert from the University of Otago, they were carefully processed and cleaned so a photographer from Te Papa could capture more than 2000 images in a temporary darkroom set up for an orca wānanga in Takutai o Te Tītī Marae at Colac Bay in October. Scientists noticed an unusual buildup of tartar on orca teeth that they had never seen anywhere in the world. They also noticed a film-like black sooty mould on teeth which had been documented before, and may be something to do with the prey they eat. Pectoral fins recovered from stranded orca were stored in a freezer for further research, and DNA samples were taken to ascertain the genetic relationships within the pod, and also to see how the pod fits into the global genetic pool for orca. Dr Visser says this study had international implications for orca research. At least five scientists attended the wānanga and a number of others worked on samples collected and sent to universities around the country. 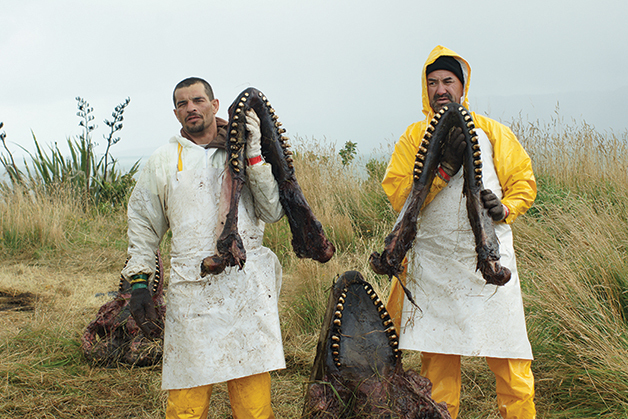 Above: Martin Keen (Ngāi Tahu, Rongowhakaata, Ngāi Tamanuhiri) and Joe Wakefield with orca jaw bones and teeth. The level of co-operation and commitment of the Ōraka Aparima Rūnaka to recover scientific samples from the animals was unprecedented, she says. “I’ve never seen anything like it. It has been indescribable how a community has rallied behind such a tragic event and turned it into something that binds the community together. “To have just walked away from (stranded orca) and done nothing would have been so disrespectful. Some people may think it’s offensive to take body parts, but we can now look at how we can learn from the experience. 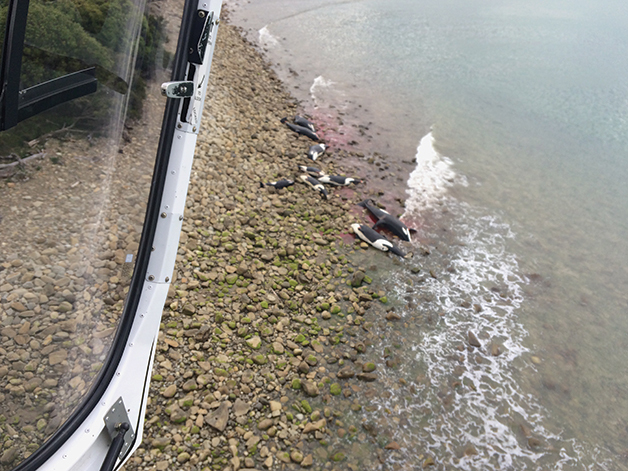 The day after the orca wānanga concluded at Colac Bay, a minke whale stranded on Raratoka (Centre Island) but it was refloated quickly by Ōraka Aparima whānau who were on the island at the time, and others who were flown over to help. While an increase in strandings could be coincidental, Joe Wakefield is concerned about the effects on marine mammals and whales of proposed seismic testing and drilling by oil companies working around the eastern and southern coasts of Te Waipounamu. Recent events show that Ngāi Tahu whānui have clear choices to make on whether they should take a proactive or reactive approach to whale strandings, and whether they need to prepare a strategy. Joe says papatipu rūnanga should consider putting together a marine mammal/whale stranding response kit, with all the equipment required to react quickly to whale strandings anywhere around Te Waipounamu. Decisions on how these kits should be funded, where they would be held, and who would be responsible for maintaining them need further discussion, Joe says. However he believes the iwi needs to take a leadership role on future strandings and review and update its draft Beached Marine Mammal Protocol so researchers, scientists, and the Department of Conservation can work together under iwi leadership to share information, knowledge, and expertise. Ramari Stewart traces her passion for the cultural harvest of whales to a single event on a beach in the Bay of Plenty 37 years ago. The Ngāti Awa tohunga tohorā says it changed her life forever. When whānau arrived to harvest a large group of pilot whales on a beach where she grew up, they were confronted with heavy machinery and told by authorities they could no longer access whales, dead or alive. At the time the Marine Mammals Protection Act 1978 was a bill before Parliament, but her whānau believed they still had customary rights to the whales under the Treaty of Waitangi. A couple of years later she knocked on the door of former Minister of Fisheries Duncan MacIntyre in Whakatāne and was granted a research permit to recover biological specimens and skeletal material from dead whales for the benefit of museums and research institutions. The research permit provided Ramari with the opportunity to hone her skills in whale recovery. The Act, however, prevented Māori customary access to beached whales until this was challenged after a series of sperm whale strandings in the mid-1990s. Today tribal rūnanga have established a treaty partnership with the Crown, and most have a marine mammal protocol with the Department of Conservation allowing access and extraction of resources from stranded dead whales. Ramari admits her work has been a bumpy ride, sometimes laced with abuse as many people clearly didn’t want Māori cutting up whale carcasses on the beaches. The focus of legislation was on rescuing stranded whales and, where rescues were unsuccessful, burying their carcasses as quickly as possible. She says these events highlight a strong cultural difference between how Māori and the Crown view whales. When a whale is washed up on the beach, Māori see it as “he taonga Tangaroa”, a treasure from Tangaroa and a resource to be utilised. She believes Māori should be involved in recovery right from the start rather than having whale bone handed to carvers to create something beautiful. “For us, the whale is the taonga,” she explains. “I believe the journey starts with the whale, and in order to establish a whakapapa with that particular whale, we should recover our own taonga. Today this former Māori health nurse, who should technically be relaxing in retirement at her base in Westland, is on constant alert for reports of whale strandings and ready to travel the country at the drop of a hat. 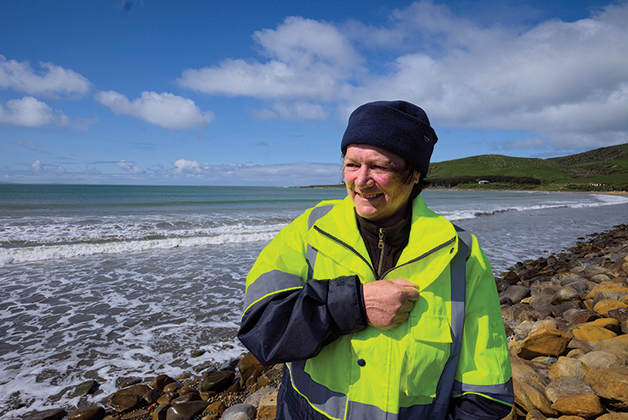 “When I was young, whale resources were everywhere, and now they are rare,” she says. Her recovery skills are highly specialised, and she has been under pressure to keep up with 14 customary whale recovery operations in four different rohe of Te Waipounamu in the last 11 months alone. When TE KARAKA caught up with Ramari, she had just helped deal with a mass pilot whale stranding and customary recovery at Ohiwa harbour in the Bay of Plenty. The previous week she was working with kaimahi from the Ōraka Aparima and scientists at Colac Bay to assess the skeletal remains of nine orca which stranded and died on a remote stretch of Te Waewae Bay in February, a rare event of huge international interest. Ramari says orca strandings are very unusual, something she has never experienced in decades of working with whales in Aotearoa and the subantarctic islands. It was also the first time she had seen Māori working alongside scientists, contributing their logistical and practical skills to the research and investigative skills of scientists. “What this event has given us, working alongside (scientists) from the beginning, has enabled them to see that we also have a huge range of skills,” she says. “We plan something to achieve an objective, we have to move fast, and we’re very good at that. This was a first-time experience for Ōraka Aparima whānau. “These muttonbirders were just a pleasure to work with, very resourceful and very resilient, and I felt very safe working among them,” Ramiri says. She would like to see Ngāi Tahu develop a rapid response whale recovery unit, bringing together experienced people and proper equipment to deal with whale strandings more efficiently and safely. Ramiri believes the work done to recover and prepare the skeletal remains of orca by southern whānau working alongside scientists at Colac Bay was unique, and could potentially be at the leading edge of orca research internationally.